Mark my words, this will be the summer of rosé. The stats back up that observation, with a recent ALSA/IRI report suggesting the pink wine category is up 16% in 2015. While the seriously bright coloured, off-dry end of the segment may be the focus for many makers, I’d argue that one of the main drivers is more savoury, textural wines like this Vignerons Schmölzer & Brown Pret-a-Rosé 2016. Vignerons Schmölzer & Brown is the venture of Tessa Brown (ex-Kooyong) and partner Jeremy Schmölzer, who have planted a vineyard at Stanley near Beechworth. While the focus for the pair is their own block, they’re also rehabilitating a twenty-year-old vineyard opposite their property. This rosé then comes from the older vineyard, plus fruit other growers (including the Fighting Gully Vineyard). I chatted with Jeremy at the Young Guns of Wine tasting a few months or so back, and the enthusiasm for their Beechworth project oozes out. Love that feeling of talking with someone on a clear mission for good. Tessa is pregnant too, just to add even more layers to the situation. Anyway, I used this wine (without trying it first) for an event a few weeks back and was impressed. Wooed, even. It’s the sort of drink that I could smash all day without getting bored. Picnic wine, with textural complexity and interest. Winemaking-wise it’s straightforward. A blend of Sangiovese (60%) and Pinot Noir (40%), it was handpicked, basket-pressed and wild fermented in old barrels, with SO2 the only addition. How you’d want a textural pink to be made. What I like here is the gentle texture. There’s hints of pink fruit and creamy marshmallow, but the style is anything but sweet – it’s delicate, dry wine in every sense. Yet the mode is so gentle that you’d almost expect there to be sugar. Instead, just soft hints of red berries just to hat tip the Sangiovese and Pinot Noir at its core. 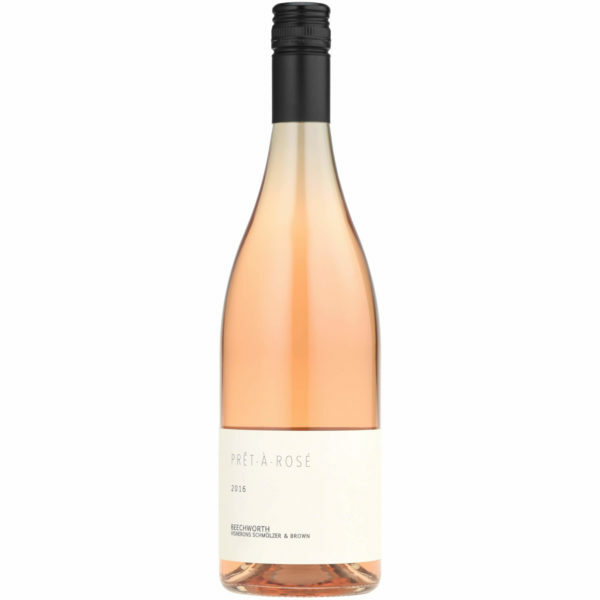 Crucially, this has that balance that Provence Rosé routinely nails, yet is a rare for Australian pink. At said event, every person enjoyed it to the woman/man, and I had to stop myself going back for seconds. Wine to drink, from a producer to watch. Best drinking: 2016-2018. 18/20, 93/100. 13%, $30. Would I buy it? In a heartbeat. Had this last week, it was pretty good. Have you tried there other wines? The Marq wines Serious Rose for me was off the chart smashable…get me a straw! Best 2016 rose I have tried so far. Hey Andrew, nice to see you at the Vin de Champagne event a few weeks ago! Any idea where to find this to buy online? Struggling to find a retailer. Ah yes, saw that but they appear to only have one bottle and, based on your description of it, that won’t be enough! Will contact them and see if they can get some more. Haha, yes it was very tame, considering the number of Champagnes they served. Biggest problem for me is that I was SO hungry at the end of the meal! I emailed Tessa at “[email protected]”. She sent me an invoice ..I EFT’d the money and had a case in my hands in less than 24 hours. Amazing. Tried the wine last night. I am going to buy another case. This will be a summer staple.